It’s true, the winter still dominates the temperatures and our mood on this side of the world, but the fairs of the beginning of this year already showed us how the upcoming spring and summer months are going to look like. January already attracted many people to the imm cologne. Uncountable novelties for furnishing enthusiasts were presented together with the special show of the winners of the interior innovation award 2015. The Maison & Object took also place in January. This international furniture fair celebrated its 20th anniversary this time. At the same time and after the cologne fair, mainly Scandinavian companies started to present their novelties on the Northmodern in Copenhagen and on the Stockholm Furniture Fair. This year’s trends of accessories and consumer goods areas were presented to experts on the Ambiente in Frankfurt. 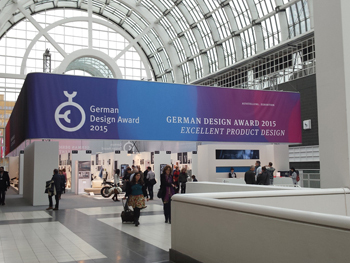 The winners of the German Design Awards and of the Design Plus were also presented on this fair. There was a lot of positive charisma on the fair: “Our anyways very high demands regarding the fair were surpassed. We are delighted about the national visiting experts and of those from abroad and we are entering the year of furniture 2015 very optimistic”, explained the president of the federal association of German furniture, kitchen and furniture shops Hans Strothoff about the fair in Cologne. But the success of the fair didn’t only come from the visiting masses. All the expositors contributed a big part to the success of the fair days with their trend-setting novelties. Individuality, naturalness, clearness and elegance are the most important factors of home trends of 2015. ”What people like, is what’s in” could be the guiding phrase of this year’s Spring fairs. Individual and creative style mixes are behind it. The results are collaged home landscapes, including different époques, materials, colours and styles. Naturalness and clearness, as you can especially find in Scandinavian designs, are in. Materials like wood, wool or marble, glass and leather emboss the picture of Scandinavian designs. Completed by clear and simple shapes and lines is how timeless and contemporary design is born. Moreover, elegant and luxurious surfaces are dominant topics. Copper, brass and chrome look noble combined with dark or stained wood as well as with marble textures – this is also going to be more and trendier. Pastell and earth tones are in regarding the new colour tastes of the users. People that want to set some stylish accents, should get back to blue, orange or green. 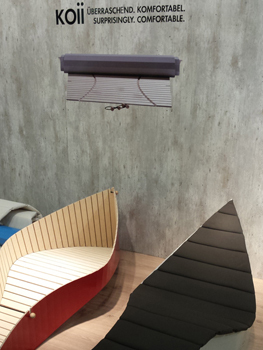 The vompany Vitra presented the collection Home Complements on the Cologne furniture fair and on the Maison & Object. This one includes already known and new accessories, with which Vitra expands the successful Home Collection. 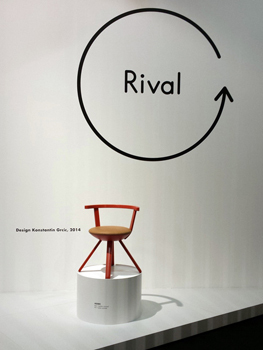 Artek presented new collections on the Cologne fair and on the Stockholm Furniture Fair as well. The Finnish company presented the tables collection Kaari in Stockholm, which emerged in cooperation with the brothers Ronan and Erwan Bouroullec, while the focus laid on the chairs of the Rival by Konstantin Grcic Collection in Cologne. We are going to inform about this soon. The German traditional company Rosenthal presented the new porcelain collection of the German design shooting star Sebartian Herkner on the Ambiente in Frankfurt. 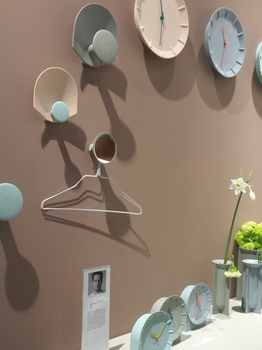 Herkner designed the ”Mitis” wall and table clocks as well as the new clothes hooks series “Meta” and the vases collection “Domo” for Rosenthal. They have porcelain as material and well-proportioned trend tones in common. Stelton presented royal design, in the real sense of the word, on the Ambiente: The Danish company could win the Swedish prince Carl Philip Bernadotte for the design of the vases and bowls collection “Stockholm”. The prince visited the exhibition stand together with his business partner Oscar Kylberg in Frankfurt. Less royal, but especially animalistic is how the Danish company Rosendahl came along. 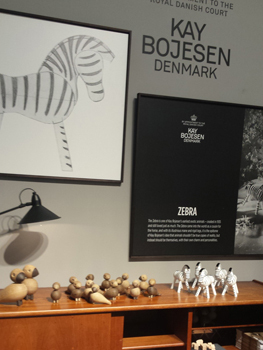 The design master Kay Bojesen expanded the collection with a zebra and the songbird Alfred. The Holmegaard Collection was completed by novelties of the popular Design with Light series as well as with one accessory for the iPhone made of glass. Completely new was what the Swedish company String did with the Works Collection. 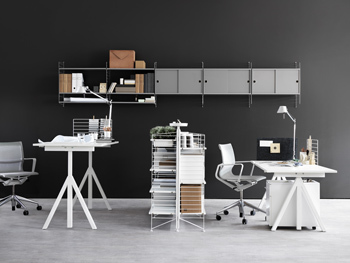 They became famous with the legendary shelving system from Nisse Strinning and are expanded with Works, an office system. The focus of this system is a height-adjustable desk, which enables many combinations by means of according accessories and a free-standing shelf – just following the principle of a shelving system. The numerous novelties including the innovative rolling sunbed Koii of Müller Möbelwerkstätten as well as the edged edition of the Ruutu vase of the brothers Bouroullec for Iittala show, how many exciting impulses are on the fairs, encouraging furniture design. The year, or the design world 2015 won’t be boring.